Like Facebook, Google+ wants to establish itself as a personal social media site. So, the rules are that business accounts are not allowed – yet. They’re coming; however, several business entities have already created accounts. Since this is still in Beta, not sure that Google is policing their policy yet. I bet they’re far too interested in all the buzz these folks are helping to generate, but don’t count on that lasting. I want both a personal and business account, so I’m following the rules and starting with my personal first. And, with the Circles feature, one profile may be all you need. To use Google+ you need a Google Account. If you’re a site owner, you need one of these anyway to use Google Analytics, RSS feeds and more. When you have your Google Account, be sure to update your profile there too, because if anyone clicks your name in the Google+ stream, that is the profile they will see. 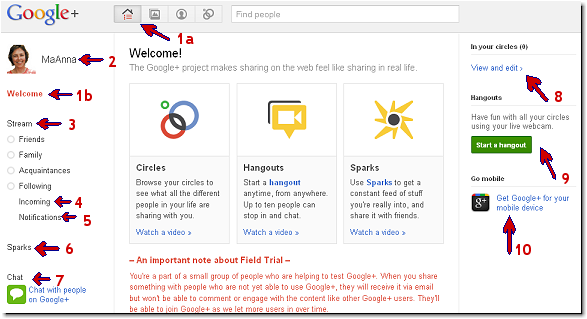 Right now, Google+ is still in Beta test and you’ll need an invitation to get on it. So, this tutorial is written from that perspective. I’ll do an update when that changes. Lots of folks who are signed on are referring to it as a G+ Account. Once you log in to your invitation, the first thing you’re presented with is your profile. Upload your avatar picture. If you’re a business owner, be sure to list it as your employer. You’ll also have the option of adding the year you started, or simply choosing the Current checkbox. And, you can make all this info Visible in Search or not. In the About section of your profile, you can include links, QR codes, and more photos. When you’ve finished, your profile page will look something like the one below. One thing you’ll want to consider is how public you want to make your profile. Folks who do not have a Google+ account can see your posts to all Circles if you make your profile public. This is the same as with your Facebook account. Below your avatar are three important links. Send an email – to send to folks on your Gmail account. The link is grayed out on my profile because I don’t have a Gmail account associated with this particular login. Your Circles – this shows the total count of folks in all of your circles. Edit Who is Visible – As you start adding folks to your network, you may want to hide posts from some of them. It’s grayed out until you start adding folks. Be sure to click the blue Edit Profile button to ensure that your profile is complete. You’ll see little sections that turn powder blue when you hover over them with your mouse. Click anywhere in the box and an editor will pop up. Below is what your About tab looks like when it’s finished. Note that I have links to my sites in two places. One is in the main content area where I have a little more room to input a tag line, and the other is in the right sidebar where I can only put in the link title. There are 10 things you’ll want to locate on the Welcome page of your Home tab. 1a and 1b – Home tab and Welcome tab show you where you are. 2 – Your name. Click on it to return to your Profile page. 3 – Your Stream. This is like a Facebook News feed. There are already some predefined Circles listed for you and you can click them to filter what appears in your stream. 4 – Incoming requests. These posts were shared with you by people who aren’t in your circles. Add people you want to follow and share with (and hide stuff you’re not interested in). 5 – Notifications. As soon as you start becoming active, you’ll see posts in this area. You can filter them with alittle link that is at the top right of that page. By default, it shows All. To filter, click the link for a drop-down toshownotices in these areas: Added to Circles, Post by You, Posts by Others, Mentions, and Photo Tags. 6 – Sparks. This is a cool feature that no other social media site has. It shows pictures of topics and has a Search bar at the top where you can find more stuff you’re interested in following. The ones you choose will be added to your sidebar. If you find a good article or post, you can share it with on your page. 7 – Chat. You will be able to have a live text chat with your other buddies on Google+. 8 – View and Edit Circles. Shows you how many folks are in your Circles. Clicking the link redirects you to a page where you can place folks in the predefined circles or create new ones. This will be one of the most powerful aspects of Google+. 9 – Hangout. Got a live webcam setup? Now you can hangout live online with one of your Circles. It’s a group video chat that you can start anytime. For biz folks, this could be a great way to do a quick teleseminar of chat and support and another way for you to be more personable with your audience. However, not everybody has a webcam and not everyone is dressed for a chat session while they’re surfing in their house shoes. 10 – Google+ Mobile App. Get the app for your phone. Early adopters say it’s working fine on Android. These options may not work well while Google+ is still in Beta. But, this tutorial wouldn’t be complete without them. There are at least three ways to invite folks. You can send a blanket email to your friends from your Gmail, Yahoo, or Hotmail email accounts. You can import your friends from Facebook to your Yahoo email account.Then, click the Circles tab at the top of your profile. Create a Circle to add your friends into. Drag all of the appropriate friends into that Circle. You can add as many at a time as you like. Then, click the Circles tab at the top of your profile. Create a Circle to add your friends into. Drag all of the appropriate friends into that Circle. You can add as many at a time as you like. The third way is to go to the Circles tab and then type the name of someone you want to find in the Search field at the top. Once you find them, click and drag them into the Circle of your choice. Since this is still in Beta, your friends may get an Over Capacity message. Tell them to wait a while and the gates may open again to allow them access. Making a post to your stream is simple. But, unlike Facebook, you can quickly filter who you send this post to by selecting the Circle that receives it. This one thing is what will make Google+ a one-stop social network for most small business owners. You can have personal and professional Circles, and view and post to them without having to switch back and forth between profiles. Here’s a screenshot of a post before it’s sent. You can also use the + or @ symbols to tag folks who are in your Circle. And, you can see who your post was shared with, even if they are not in your Circle. That’s a great networking element. Plus, you can chat directly in the stream. If you leave a comment to a post, you can edit it anytime! You can also re-share a post. Going viral is easy, and, more importantly, you can see who’s sharing it. There is an ugly side to this that I hope Google fixes. Every time a post has a comment, it comes back to the top of your feed. While that sounds like a good idea in theory, in practice most folks prefer to see the stream in chronological order. And, if something does go viral, maybe you don’t want to see 100s of posts. The good thing is, you can mute it. Here are a few keyboard shortcuts for reading your stream. To go down the screen, use the “j” key or the Space bar. To go up the screen, use the “k” key or Shift + Space bar. To scroll down comments, use the Tab key. To go to the end of a comment section, use Tab + Enter. If you have a Gmail account, you’re going to start seeing notifications of your G+ activity. So, you might want to turn that off in your profile. At the top of the page is a black status/admin bar. On the right side is your login name. Click it and go to Account Settings. In the left sidebar, click the Google+ link and uncheck any boxes on which you don’t want to receive email notifications. Google is a search engine. They sell ads. 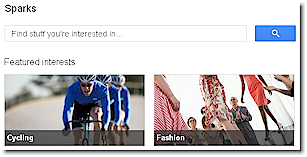 How better to track buyer interest than to view the combined data from a social network, +1 likes, and regular search. If you want to get found on Google, being everywhere Google is looks like the most integrated way to get your site ranked. Are they playing favorites? Oh, you betcha. Can you benefit from that? Oh, you betcha! 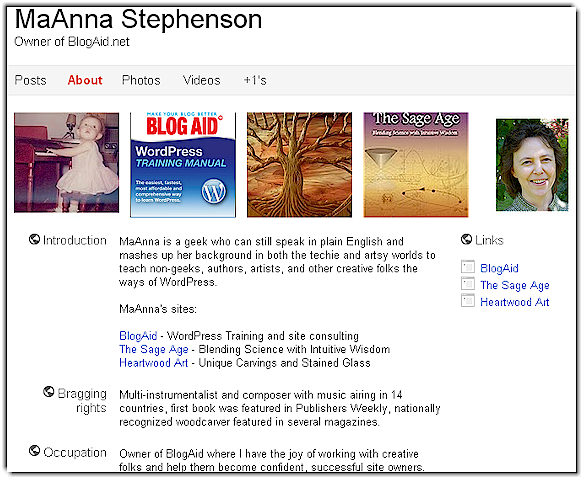 I’ve been a late adaptor of adding the +1 button to BlogAid because alone, it was really lame. But, coupled with a Google+ social network, I’m beginning to feel the power of the force, so to speak. And, whoever has not had great success with Twitter will have another reason to leave it. Years ago, when Twitter started, I had good success with it. But, BlogAid barely has a presence there now. It’s nothing more than an echo chamber and spam magnet to me. I also see Google+ as a real threat to Quora, where folks go to get answers from experts. And, it may do in Flickr and Facebook Photos. I’m tickled pink with the instant integration to YouTube, especially since BlogAid video tutorials posted on YouTube are such a wonderful traffic source to the site. Some folks are whining that they’ll have another social network to keep up with. You know what that tells me? They’re not very social at heart. They just want to use it as a free billboard. Well, that’s what I’m trying to get away from, so I hope they don’t come over to Google+ and they stay on Twitter and Facebook. My hope is that Google will roll this out to everyone soon, else they are going to loose their buzz and momentum. And, they may create a counter-culture backlash between the have’s and have not’s. So, bookmark this tutorial and I’ll see you when you get there! Or, look me up (MaAnna Stephenson) and let’s connect. Great tutorial. Just started yesterday. I am “whining” because I’m part of so many forums that I try to stay active in, groups on websites, commenting on others blog posts, give +K daily, Stumble, Tweet, FB, blog, work, parent as a single mom, and every day life. I can only do “so much” as one person before I’m out of time for the day. I’m spread thin as is, so I don’t think it necessarily has to do with being social as you can see, I’m very active being social. I totally understand your point. I’m spread just as thin and have to sacrifice one platform to participate in another. But, that’s the key, at least to me. I try to be very careful about my ROI and ensure that I participate at a level that actually has some impact and garners results. Right now that is Facebook for the most part. I’ve all but given up Twitter anyway, and my participation in G+ will probably do that in. And, when G+ rolls out biz pages, that may do away with the little bit of time I spend on LinkedIn. I know everyone has their platform preference, but I’m to the point that I think it’s silly to carry the same info on multiple sites. I think that if I’m offering something of value, hopefully I can lure folks to the place I spend the most time delivering that content. That’s the best compromise I think I can make at this time and still remain focused on my primary duties, which are taking care of clients directly. It’s been a few months now. Have you heard any rumors about when Google+ is coming out of beta and available to all? Last I heard, as of July you can join through your Google account without an invitation. They have also opened the gates to folks who are invited. However, each person already on there has a limit of 5000 folks they can connect with. So, I’ve stopped seeing as many open invitation posts.